True 1:1 macro lens never been cheaper than old non-AI Nikkor lenses. Watch out Ebay frequently and if you are lucky you will be a proud owner of this lens as I am. This a perfect lens, very,very sharp, macro ratio 1:1 it has wonderful color rendering and one of the best bokeh what I ever seen, believe me I saw pretty much.Optically perfect I can't imagine better lens,more faster would great but 3.5 also good choice for macro work, because most of macro captures required to use flash or other external light source anyway. Only the problem what we need to accept on AI compatible camera bodies like latest NIKON DSLRs, aperture ring not works if lens is mounted on camera body.Must pre-set aperture value, before mount on camera body, this little inconvenience , not a big deal compare with low price and outstanding image quality. I have a 55/3.5 Micro Nikkor P and a factory AI converted Micro Nikkor PC. Both are excellent and are good for subjects both near and far. Eventually I would like to add a 55/3.5 AI and a 55/2.8 to round things out. When the light is good a 55/3.5 P or later really is a nice normal lens. I have been using Nikon lenses and cameras for over 25 years, and the 55mm Micro is without a doubt one of my all time favorites...and like you Wayne, I have used it as my main lens for many years. I use this lens quite frequently as a photographic artist specialising in portraiture in the Derbyshire Peak District of Britain. The results are first class. I am unable to comment on the use of this lens on digital cameras as I only use traditional cameras such as the Nikon F/F2 and the Nikkormats. The built-in meters of these cameras are not reliable so I use Gossen meters for reflected and incident light metering. On the early lenses the "P" means penta--for five elements, and the "C" refers to coated. Both marks were dropped later. Have you done any tests to see what the lens is like wide-open and where it's sweet spot is? I wondered at what point its definition & contrast was best. 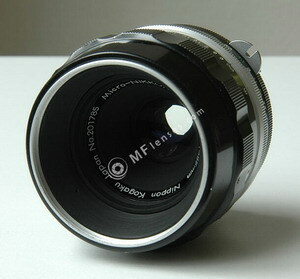 I have a 50mm f 1.8 'Pancake' (AI-S). That peaks around f4. It doesn't focus very close & it also needs a service. It is time the Micro-Nikkor came out for a play. Not sure what to expect from it yet.